We invite you in, pull up a chair and browse through our old west book selection. Here you will find books on Wyatt Earp, Doc Holiday, The Earp Brothers, Tombstone and it's history including pictorical books. Need a book about Boot Hill, Arizona Ghost Towns and Mining Camps, or what about a book on prostitution in the old west? You will find them all here along with many others including southwestern cookbooks and mystery novels set in Cochise County by J.A.Jance. Many of these books are printed by local printers and are hard to find, some no longer even in print; so enjoy looking through selection of books on the life and times of people and places. We carry more book titles in our store located at 504 Allen Street in Tombstone, Arizona. If you do not see what you would like to have here please call (520) 457-3335 during our normal business hours and we will be glad to help you. Arizona Ghost Towns and Mining Camps by Philip Varney provides what is considered by most the premier handbook fo getting to know the history of major AZ Ghost Towns but also directions, photographs, before and after and GPS waypoints. Doc Holliday is a well written biography that follows the life of John Henry Holliday aka "Doc Holliday" from his birth to his death 36 years later. 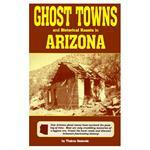 Ghost Towns and Historical Haunts on Arizona by Thelma Heatwole. Visit the towns of Arizona's golden past, see adobe ruins, old mines, cemeteries, cabins and castles! Learn the history and location of these crumbling tributes to the old west. Ghost Towns and Lost Treasures by Ben Traywick. The ghost towns of Cochise County, AZ and the lost treasures and mines in Southeastern Arizona and northeastern Sonora. There are more stories about these towns than any others in the old west. Historical Documents and Photographs of Tombstone, Arizona by Ben Traywick chronicles the historical pictures and documentation that was gradually dissapearing over time. Legal documents, legal letters, receipts, court and city records, maps and more. John Henry - The Doc Holliday Story by Ben Traywick. 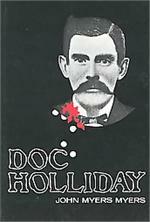 This book captures the persona of John Henry Holliday aka "Doc" Holliday unlike any other book with in-depth research and close attention to detail, chronicling Doc's life from childhood to Tombstone. By Ben Traywick. This book is the sequel to "The Chronicles of Tombstone" and in this volume Ben Traywick deals with more of the colorful personages and outlaws who made SE Arizona one of the wildest areas of the old west. Historical black/white photos. By Anne Seagraves. Soiled Doves is a well written, fascinating view of prostitution in the old west during the 1800's. Touching, insightful presentation of the lives and stories of the women along with rare historical photographs. Tombstone, Arizona: The Biggest Little Book of 120 Old Historic Photos, including Wyatt Earp's Collection of Old Photos. The Chronicles of Tombstone by Ben Traywick. This is the story of Tombstone, Arizona Territory during the Old West starting with the founding of the town by Ed Schiefflein and through the times of the Earps. Black and white historical photos. The Earp Brothers of Tombstone by Frank Waters is a composite biography of the Earp brothers - Wyatt, Virgil, Morgan, James and Warner based upon the recollections of Mrs. Virgil Earp and additional documnets that were found at a later date. 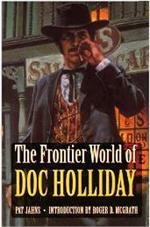 The Frontier World of Doc Holliday by Pat Jahns with an introduction by Roger D. McGrath is a biography written in 1957 that unearths the real Holiday. 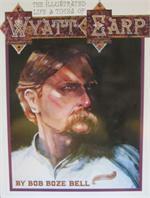 The Illustrated Life and Times of Wyatt Earp by Bob Boze Bell. Beautifully written and illustrated with authentic photos, maps and illustrations, many never before published. You will enjoy this no-nonsense style visual tour of the Old West. Tombstone's Boothill by Ben Traywick. This book tells the stories behind the epitaphs and people behind the headstones that are found in the famous old west cemetary "Boothill" in Tombstone, Arizona. Contains black/white historical photos & documents.